The Chicken or the Egg? Disciplinary Order in Theological Education | Dr. Z. Ministry begins with God himself, and the absolute authority belonging to him as creator of all things. Believing the Bible is the inerrant and authoritative word of this God, we must approach the Bible with the goal not of using it for our work, but submitting to it as God’s word. How can we practically submit to God’s word in various ministry contexts? And how can we train leaders for a ministry that is obedient to the authority of God? The starting point is biblical exegesis, the task of carefully reading and discovering the intended meaning of biblical texts in their original language and contexts. Then we move to biblical theology, wherein we put together the results of our exegesis to understand the theological message of a given section of Scripture, or how a given theme is developed throughout Scripture. Then, and only then, we can develop a systematic theology, based on our exegesis and biblical theology, that synthesizes logically the teaching of the entire Bible. 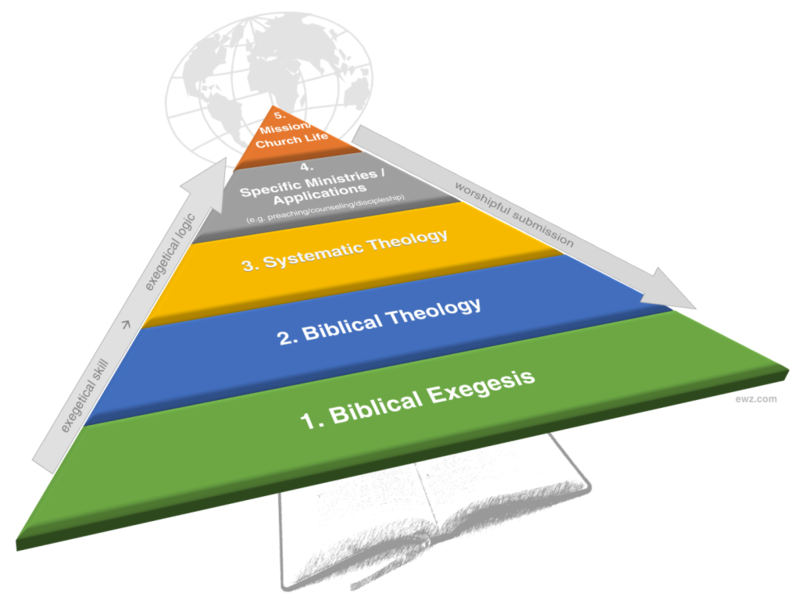 Finally, we can apply our systematic theology, biblical theology, and exegesis by building a philosophy and practice of specific ministries, such as preaching or counseling. And by following all of these steps the result is a church life and mission that are thoroughly biblical, faithful, and operating in submission to God through his Word. To look at it from the other direction, we might ask – “why is expository preaching so important to the ministry of a church?” (level 5). The answer to that is found in our biblical philosophy of preaching (level 4), which is simply systematic theology (e.g. doctrines of Scripture, of man, of salvation) together with biblical imperatives about preaching (level 3), which is based on a biblical theology and story of a God who communicates and reveals himself through proclamation (level 2), which is based on the exegesis of individual texts each of which contribute something important to our understanding (level 1). The ordering of the different parts of this paradigm are purposeful. If you change the order, problems ensue. For example, what if 3. Systematic Theology was put first, in front of 1. Biblical Exegesis? This would mean bringing a preconceived set of theological beliefs to the text instead of deriving them from the text. This would mean a situation where the exegete is not free to follow the text wherever it goes, but has limited the possible meaning of the text by the theology he started with. Similar disorder would follow other rearrangements. The top of the pyramid (levels 4 & 5) can’t exist without the bottom. That is true whether or not a particular ministry acknowledges it. For example the structure of every church’s worship service (#4) by what is present, what is absent, what is emphasized, etc, assumes a certain systematic theology, biblical theology, and exegetical approach to certain texts. If this isn’t coming from careful handling of Scripture, it is coming from somewhere else, such a received tradition or cultural pressure. Every ministry is the tip of a biblical-theological iceberg. But some icebergs melt faster than others. So, turning the focus to theological education, if this paradigm describes how we should actually do ministry, it must also inform how we train for ministry. Most pastors will spend large portions of their ministry concerned with level 4 and level 5. Does that mean these two should be the focus of training programs? Many think so, but this approach has serious problems. Method without foundation. Students may learn to do things, but lack the foundation that would help them see the bigger picture of why they do what they do, and why it is done certain ways. The “why” question is unanswered. Knowledge without conviction. Biblical conviction, and its accompanying passion, comes when one is convinced by study of Scripture. Learning a bunch of ministry “how-tos,” separated from students digging into God’s word for themselves, will lack conviction. Ministry / personal separation. Being a dependant student of Scripture is vital for the ongoing character development of leaders. Giving prepackaged content and methods assumes this doesn’t matter. Teacher dependance. Focuses on the top levels is giving a man a fish. It is the quickest route to accomplishing something, but it creates dependence on the teacher and his experience and methods. But training in exegesis, biblical theology, and systematic theology, is teaching men to fish, helping them to independently operate and be ready for situations I never envisioned or knew to prepare them for. Cultural enslavement. Each step up the pyramid is more culturally specific than the previous one. Top-level training enslaves the student to the culture of the teacher and/or the setting in which the materials were produced. But if their training has prepared them in exegesis and theology, they will be prepared to develop the ministry practices that are both faithful to Scripture and targeted to the specific situation in which they serve. Ministry training, then, is primarily about giving students the tools to move themselves up the pyramid. This journey up the pyramid is about the exercise of exegetical skill and employment of exegetical logic. When each discipline is studied and practiced in submission to the disciplines below it, then the whole ministry is ultimately in submission to the authority of God as revealed in his word. Time is limited, they say, and the Great Commission is urgent, so let’s keep the training programs short and get them out there. But this “less is more” argument makes as much sense for seminary as it does for medical school. Because of the lostness of the world and the urgency of our mission, we must be willing to make the investment to get it right, and carefully train from the bottom up. This will not only lead to obedient ministry but, I believe, the most effective ministries in every context among the nations.